It's hard to believe that it's been five years since the original Gears of War released on Xbox 360, less than a year after the console's release. And while the series has certainly matured over the years in a number of ways, it hasn't necessarily undergone any sort of massive reinvention, either. But that's not entirely a negative thing. Instead of crow-barring in changes to the formula where they don't belong, Epic Games' has kept their sci-fi franchise fresh and interesting by gradually introducing new features, ideas, and enhancements that build on the core Gears experience. In doing so, they've preserved the essence of what's made their brand of cover-based combat so revered, while not making it feel like just a lazy sequel. Gears of War 3 stays true to this design philosophy, too. Even though at times it plays more like a continuation of the previous installments, it's still a much more refined action experience than the previous games -- and it makes seeing the trilogy through to its end worth it. But Gears of War 3 isn't entirely devoid of new features. Arguably the most notable change introduced in the new game is the addition of four-player co-op. Playing through the main story with up to three other players not only makes the campaign more enjoyable, it actually allows for more strategic opportunities, too. The inclusion of four-play co-op feeds into Gears of War 3's narrative as well. Throughout the campaign, one group of characters will be occupied with carrying out a mission, while another will be engaged in a completely separate task, oftentimes located on an entirely different place in the game's world. The paths of these different groups will often cross, which results in the game frequently shifting your perspective so that you'll experience separate events going on at the same time. These parallel missions help give this final confrontation between the human heroes of Gears of War and their Locust nemesis a much more epic feel. It's unfortunate, however, that more time isn't spent further developing Gears of War 3's new characters. There are a lot of new faces introduced, but their backstories aren't nearly as fleshed out as series regulars like Marcus Fenix, Dominic Santiago, and the rest of the "original" Delta Squad crew. The result is a lopsided storyline where memorable moments are overshadowed by scenes that'll have you scratching your head. There are also quite a few moving moments in Gears of War 3's storyline, which is something the series has previously only lightly dabbled in. Without spoiling what exactly happens, there are some unexpected events peppered throughout the campaign. And even though some of these tender moments feel a bit awkward and forced amidst the non-stop carnage and chaos, the risks that the Gears' writers take make for the strongest storytelling in the series yet. And while Gears of War 3's single-player experience is lacking in certain respects, its robust multiplayer offering is not. In fact, the multiplayer experience as a whole is tremendously satisfying. Series favorites like Gears of War 2's Horde survival mode return -- with notable enhancements like decoys and deployable defenses like barbed-wire fences that slow down enemy forces. One of the more exciting modes in Gears of War 3, however, is something entirely new: Beast mode. On the surface, it's an inversion of Horde mode where you get to play as the bad guys -- the Locust Horde -- instead of Marcus and co. But it's far deeper in that it becomes a race against the clock to slaughter your human targets as quickly as possible to add time to the clock, as opposed to Horde where your objective is to stay alive as long as possible. Playing as each of the different Locust characters feels different, too, as some of the bulkier classes move around the battlefield sluggishly and rely on powerful melee attacks to take out opponents. Others monsters like the Tickers help out their fellow beasts by chewing through barricades and other defenses. There's even a giant centipede ("Serapede") that can quickly move around the map and can only be harmed by attacking its radiant rear end. Even if you only play through Gears of War 3's campaign once and never return to it, there're enough multiplayer modes and unlockables that it'll keep you busy for many months after its release. 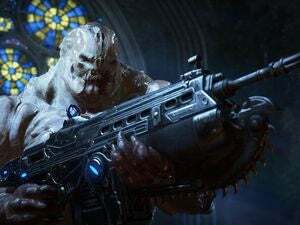 Gears of War's multiplayer has been criticized in the past for being a shallow affair that doesn't compete with other shooters, and the developers have done a commendable job of really overhauling it this time. At long last, the end of the current Gears of War story arc is finally here. And even though the Gears formula hasn't been altered dramatically, who cares? It's still the most polished and satisfying entry in the series, and it presents enough fresh ideas to make it worth seeing through to its gripping conclusion. This story, "Review: Gears of War 3 Improves on Series Without Being Revolutionary " was originally published by GamePro. The third installment in Epic's cover-based combat series brings Marcus Fenix's Locust-lynching saga to a satisfying conclusion.